I haven’t had as much time to read and to review as usual, so you will get a couple of lightning-form reviews here (not my preference, but better to get the brief word of out on books rather than not discuss them at all)! With apologies as always for any typographical, grammatical, or factual errors. My intent in these reviews is to illuminate the wide ranging and expansive terrain of Asian American and Asian Anglophone literatures. Please e-mail ssohnucr@gmail.com with any concerns you may have. 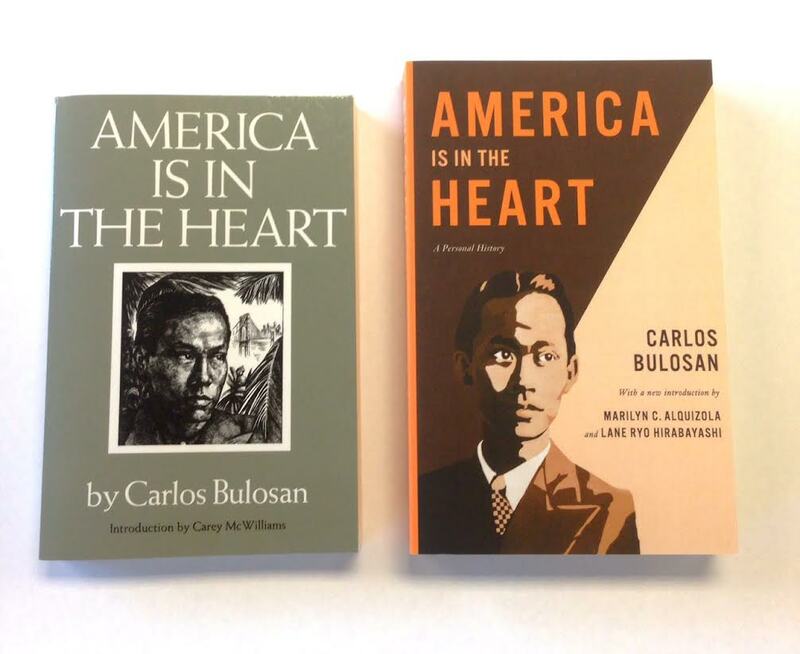 In this post, reviews of Carlos Bulosan’s America is in the Heart (University of Washington Press, 2014), John Okada’s No-No Boy (University of Washington Press, 2014), Miné Okubo’s Citizen 13660 (University of Washington Press, 2014); Monica Sone’s Nisei Daughter (University of Washington Press, 2014); Kimiko Hahn’s Brain Fever (W.W. Norton, 2014); Hoa Nguyen’s Red Juice: Poems 1998-2008 (Wave Books, 2014); Yang Huang’s Living Treasures (Harvard Square Editions, 2014); Maija Rhee Devine’s The Voices of Heaven (Seoul Selection, 2013). 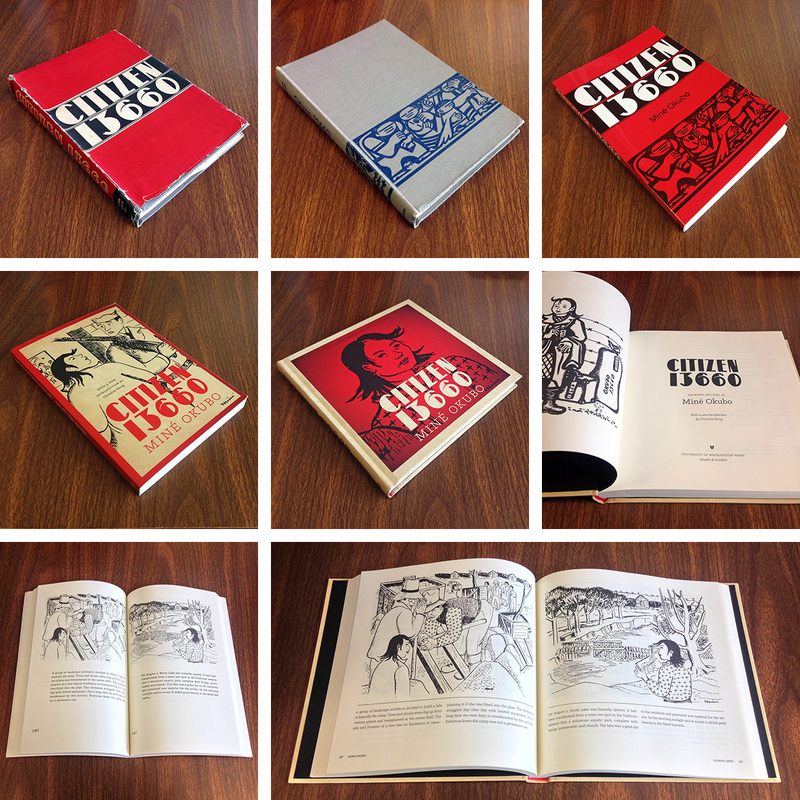 Okubo’s Citizen 13660 (University of Washington Press, 2014); Monica Sone’s Nisei Daughter (University of Washington Press, 2014). These reprints are being rolled out over the next couple of years, and these first four have been given the reprint treatment (two more are on the way and I will be reviewing them at a later point). The impetus for these reprints seems to be primarily aimed at giving these books a larger cohesion as a collected set. Each title in the series comes with a cover and color blocking that comes to match the others in some form; all the reprints so far also include a cover image that are art/ photography pieces in one form of another. The cover to No-No Boy, for instance, includes an image of a large face that was drawn by Jillian Tamaki; Citizen 13660 includes an image from the graphic narrative itself; and America is in the Heart includes an image from a mural painted by a group of artists. 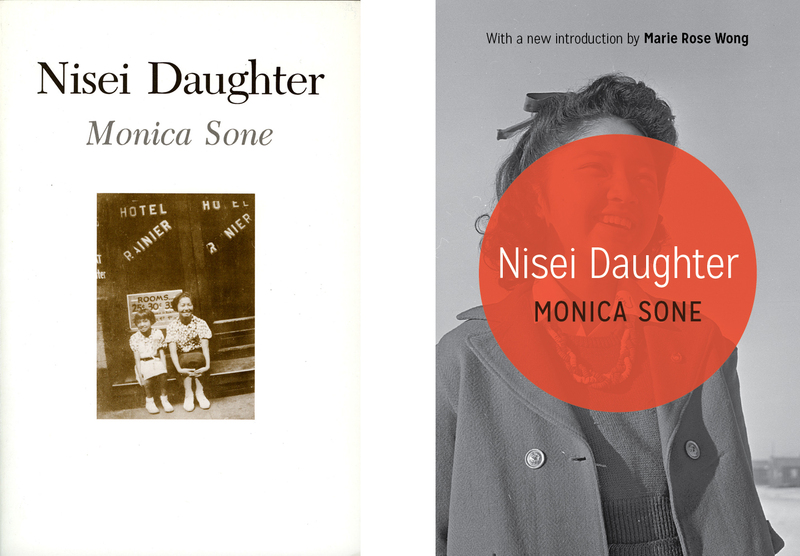 Monica Sone’s Nisei Daughter includes a cover photo by Thomas W. Parker, who was part of the WRA’s head of the photographic section and thus an important figure in the documentation related to the Japanese American internment. Each book is obviously a touchstone for Asian American literature, so the reprints also all come with new sections. For instance, Ruth Ozeki pens a letter to John Okada at the opening to the No-No Boy reprint, revealing a Japanese American intergenerational link that is both poignant and vital to understanding the impact of the novel through ethnic identifications. Christine Hong provides a luminous introduction to Okubo’s Citizen 13660 that contextualizes its complicated publication history and reception. In a similar manner, Marilyn C. Alquizola and Lane Ryo Hirabayashi explore the continued impact that America is in the Heart has had on Asian American studies (and race and ethnic studies) and further offer a useful exegesis of the critical terrain concerning this key cultural production. Marie Rose Wong provides a pithy new introduction to Sone’s Nisei Daughter and much like Alquizola and Hirabayashi provide a sense of the historical reception of the work. I found the introduction offered by Ozeki to be the most compelling only insofar as it provided a direct indication of Asian American literature as a kind of genealogy in which one generation of writers influences the next. There has been a tendency (at least from my experience) to consider Asian American literature as a “unfounded” tradition, one that does not have a discrete historical legacy that appears to accrue genealogical meaning over time, but this assumption is especially wrongheaded in this contemporary moment in which the very terminology of Asian American literature has been in use almost for half a century at this point. The one snag for academics who regularly teach these books (like myself) is that these editions do not necessarily have the same pagination as the previous editions. I checked the No-No Boy copy against my older version and the pagination is definitely different; I didn’t have the earlier editions of the other titles, but my educated guess is that they will not have maintained the same pagination, rendering earlier copies a potential problem for classroom use. But, these reprints give you an excuse to re-read these works and discover your love for them anew, granting you a refreshing opportunity to re-annotate these handsome new editions, using your trusty pen and pencil or post-it notes. A Lightning Review of Kimiko Hahn’s Brain Fever (W.W. Norton, 2014). feeling her hiccup inside the inside. the son-in-law rations my weather (13). I picked this poem in part because of its alliterative properties and the fact that it will connect quite well with the other lightning form review poem that is posted below. Why shouldn’t we have poppies, pomegranates and porch lights all come together? But, beyond these rather strange sequencings of lyrics: a calendar from whence springs a daughter and a son-in-law who apparently apportions the “weather,” we can’t help but get a sense of something mythic going on here as soon as the pomegranate imagery appears. Hahn begins her potpourri of associations, as the sense of familial rupture is placed alongside the Greek myth of Persephone who could of course only spend half the year with her beloved mother Demeter. The reference to the “hiccup inside the inside” denoting the once embryonic state of her child, who once moved inside her mother’s body. References to barley make more sense in this instance, as Demeter, the harvest goddess, would be associated with such a grain. Perhaps, this poem then functions to consider the “empty nest” syndrome that might come with a daughter leaving home to be with her husband, only to return during certain months of the year. But, this one poem is of course part of the largely, sometimes disconnected, but also innovative collection, in which the lyric speaker finds herself juxtaposing various discourses together: the personal, the scientific, the unexpected all in furious bloom. Expect to be filled with lyric euphoria, a heady feeling that comes with Hahn’s scorching Brain Fever. A Lightning Review of Hoa Nguyen’s Red Juice: Poems 1998-2008 (Wave Books, 2014). on your bed-stand Remember-the-dead poppies (23). I unfortunately cannot reproduce the exact formatting that Nguyen employs for this delightfully and sonically innovative poem. We can see the “pop” in poppies sparking of the page, as the reader jumps from one phrase to the next. The interesting use of enjambment and formatting all contributes to this readerly “popping” from one line to the next. But this kind of poem is more largely illustrative of Nguyen’s willingness to use sound packets (phonetics), enjambment and formatting all to enhance a given context. In this case, the blooming of the poppies in all of their strange and wonderful morphologies continues to crop up in unexpected places. The collected poems in Red Juice are of course full of these lyrical surprises, entertaining twists of sonic, structural, and signifying turns and we’ll eagerly await what Nguyen will have in store for us in the future. A Review of Yang Huang’s Living Treasures (Harvard Square Editions, 2014). It’s general formation brings about the intriguing way that publishers can be created simply out of the richness of social networking produced through education. Further still, the entity seems to be independent of university press publishing, which allows this kind of press to focus more specifically on literature (rather than say academic studies). In any case, Yang Huang can be grouped with the Asian American writers who have emerged in the post-Tiananmen period (along with the likes of Yiyun Li, Ha Jin, Qiu Xiaolong, Diane Wei Liang, and others). Her novel, Living Treasures, is a kind of bildungsroman for its heroine, Gu Bao, who is in college during the height of the Tiananmen Square protests of 1989. She’s not really interested in the protests and is far more concerned with her ongoing romance with a handsome soldier named Tong, who is slightly older than her (she’s eighteen). She has shielded her educated parents from her romance because she knows they would disapprove of her choice to date a man in the military. She herself is a law student with ambitious plans for a career in the profession, a trajectory that is imperiled when she finds herself pregnant with Tong’s child. Her parents immediately encourage her to get an abortion, one provided by a country doctor who lives in the vicinity of her beloved grandparents. Tong is driven out of Gu Bao’s life after realizing that Gu Bao does not want to give up her dreams of a professional future and would rather abort the baby to pursue rather than marry Tong. In the wake of their break up, Gu Bao travels with her mother to the countryside for the abortion, receives it, and then recuperates there with the help of her grandparents. Gu Bao is of course conflicted about the abortion, and much of her initial time in the recovery period is spent grieving over her unborn child (who she had named Soybean). A chance encounter with a pregnant woman on a rocky hillside allows her to make an unexpected friend, but one who has a secret. Indeed, this woman, Orchid, is pregnant with her second child, thus she is in hiding due to China’s one-child policy. She lives alongside her husband and daughter in a makeshift home created from a cave located in the hillside and will eventually go into seclusion with a midwife once she must deliver. Gu Bao’s friendship with Orchid is important, as it provides her the opportunity to be near to a mother figure, and she begins to dream of the possibility that she can have a second chance at romance. The concluding arc shifts the plot into high gear, as Gu Bao sends a letter to Tong, hoping for a rapprochement. When Tong is willing to visit her, Gu Bao requests that he stay with Orchid and her family, knowing full well that Tong would have to keep their location and situation a secret from authorities. As you can imagine, things start to go wrong, and Gu Bao (along with the help of Tong) must find a way to make things right. Readers will be pleasantly surprised, I think, by the adventurous conclusion, which seems more along the lines of an action plot. Of course, Huang’s novel benefits from the tremendous inclusion of social, political, and historical textures. Though Gu Bao is never a student revolutionary, she is well aware of the gravity of the events, as one of her closest classmates suffers from the tragic and violent loss of a loved one associated with the Tiananmen protests. Further still, the novel’s exploration of the one-child policy signals the problematic issues related to the Chinese woman’s body, especially in the modernizing country. Gu Bao’s own predicament over her abortion gestures to the apparent impossibility of being a single mother and a career woman, while Orchid’s seclusion and continued paranoia over her situation register the stark reality of the political harnessing of biopower. The novel offers an incisive fictional account of the perils of Chinese motherhood in all of its contemporary manifestations. A Review of Maija Rhee Devine’s The Voices of Heaven (Seoul Selection, 2013). The Voices of Heaven immediately intrigued me because it deals primarily with a fictional account of the Korean War. I occasionally have discussed this issue because both of my parents endured that period of time, with my mother and her family in particular being displaced: they were forced to flee southward when their home in Seoul was bombed. Devine’s novel begins just prior to the start of the war, with narrative perspective vacillating among four different characters: Gui-yong, a middle-aged Korean American man without a male heir; Eum-chun, Gui-yong’s wife; Soo-Yang, the soon-to-be mistress of Gui-yong who is given a spot in the home in the hopes that she will bear Gui-yong an heir; and Mi-Na, Gui-yong and Eum-chun’s adoptive daughter. What was immediately interesting to me about the story was the exploration of a concubinage system that I didn’t understand still took place in that period. The entire family structure, of course, deviates from American heteronuclear family ideals. Even Mi-Na’s adoption is a little bit out of place and culturally complicated for Korea at that time, especially as evidenced by Mi-Na’s treatment from the few who know of her origins. Indeed, both Gui-yong and Eum-chun worry that Mi-Na’s ancestry will be unmasked and no one will be want to marry her because she does not have definable progenitors. When the war finally does occur, the family disintegrates, with Gui-yong being separated both from his wife and mistress. Eum-chun ends up on her own for a long time caring for the daughter (Li-Ho) of her sister and Mi-Na, while Soo-yang eventually does bear a son (and many more children). Amongst the constant bombing and threat of death, the narrative of the family’s reunification drives the plot forward. Will all the characters survive and find their ways back to each other? Eventually they do, and Devine’s biggest contribution is continuing to contour how we understand the Korean war through the terrain of cultural production, a project that has been taken up in some part by writers such as Richard E. Kim (The Martyred), Susan Choi (The Foreign Student), Chang-rae Lee (The Surrendered), Suji Kwock Kim (Notes from a Divided Country), Myung Mi Kim (Under Flag), and Sunny Che (Forever Alien). Devine’s novel unfortunately suffers from a hasty wrap-up, as the pacing suddenly fast forwards, and we see many, many years of Mi-Na’s life pass by. In this section, we begin to see more of the feminist impulse appear with respect to the changing attitudes related to women and education. Mi-Na well understands that her educational opportunities are unlike those offered to her mothers, and we begin to see how her emergence as an academic star is of course a way for her to escape the paternalistic system of marriage and concubinage that had structured her own family. This change in character development becomes jarring, and by the time the reader reaches the poignant ending, there is some frustration because it’s clear that Devine probably had at least one other novel’s length of a book to write, especially involving Mi-Na’s eventual arrival in the United States. The conclusion sees Mi-Na returning to Korea, where she is given a key piece of information that the readers had known all along. This moment also seems to suggest yet more possible places for a novel to go, but by then, Devine’s novel is over. Though I wasn’t a fan of the novel’s concluding pace, the political and sociohistorical import of Devine’s novel cannot be denied, as it presents us with an invaluable fictional account of the Korean War in all of its violent and brutal morphologies. Thanks for the review! I want to see Ozeki's intro to NoNo Boy.